Ariel Leonardo Gutierrez is the founder of Ariel Designs, which focuses on transportation design and 3D CAD modeling. 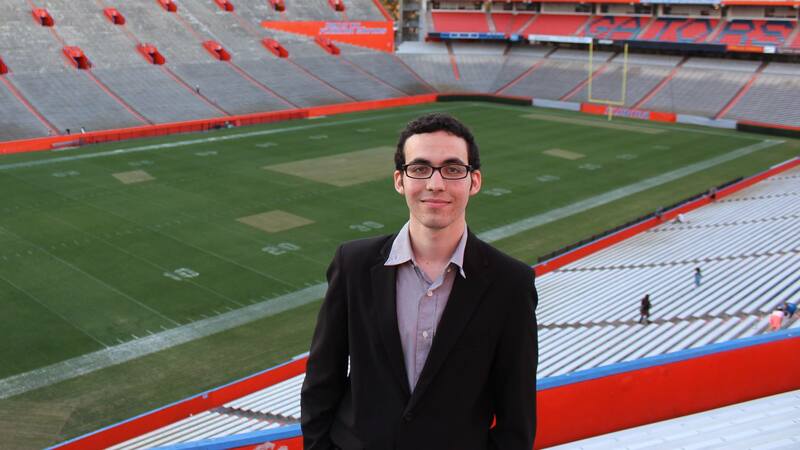 He is currently studying at University of Florida to obtain a Bachelor’s Degree in Mechanical Engineering. Through the Miami Dade College (MDC) Honors program, he obtained an Associate’s Degree in Mechanical Engineering. At MDC, he served as a drone instructor for the STEM Ladder. Ariel did undergraduate research on Quantum Computing and Josephson Junction at St. Thomas University. In addition, he has participated in conventions including Washington Center Seminar and United Nations 7th Millennium Campus Conference. Also, he participated in the LITECAR challenge created by Local Motors and ARPA-E. In 2015, he was recognized as an “Inaugural Pearson Scholar”, an honor only given to ten students in United States. In the International Vehicle Design Committee, he has sought to inspire designers locally and globally to forge new ways of saving the environment by replacing the conventional use of internal combustion engine cars with sustainable, green vehicles. Recently, he worked for ZuidWesterSloep and created 3-dimensional models of their upcoming electric boat concept. Hey Ariel, great to have a fellow entrepreneur from Latin America here. What experiences growing up shaped you into the entrepreneur that you are today? I grew up in a small town named Diezmero, where inventing was a hobby for everybody. That remote place located in La Habana, Cuba, was the cradle of my vision as a designer and engineer. Cubans have always been self-taught designers and engineers because they learn these things to survive in the Cuban regime. Since I inherited this feature, I was always building models of wooden ships and planes. In addition, I watched the movie Titanic when I was about six years old and that was when I finally realized that I wanted to become an engineer and create a vessel that could surpass any engineering barrier to prevent another similar catastrophe from happening. When I was in Cuba I had to read Jules Verne’s “20,000 leagues under the sea” for a school project. Jules Verne, “The Father of Science Fiction”, had a unique vision of the future and this inspired me to think out of the box and imagine the unimaginable to design vehicles. Furthermore, Jacque Fresco, “our modern-day Da Vinci”, greatly inspired me to self-teach many of the programs and techniques that I use nowadays to design. I started Ariel Designs about four years ago under the name TheCadArt where I gave tutorials in YouTube showing how to make 3D models and illustration. I am currently improving the online platform for Ariel Designs such as the website and social networks. What was the spark of your design business? I always wanted to have my own design business but an important motivation I had to make this start-up was to promote environmental sustainability. I think that every inventor, engineer, and designer should think carefully about the environmental impact when developing something new. Ever since I started this project I have been creating concept work that is sustainable. For example, when I participated in the LITECAR challenge through Local Motors and sponsored by ARPA-E, I designed an electric concept car. In addition, when I worked for ZuidWesterSloep I did 3D models of a 9-meter electric boat. How is your service different and unique? My design service is different from others because I like to divide each design work in many small segments. During each segment, I contact the client in case there is need of a modification or improvements of the design work. I try not to give limitations to these modifications because I believe in a client’s satisfaction and in a successful project; however, after certain amount of modifications there is always a charge. My clients include companies that are interested in concept design and in 3D modeling. In addition, individuals also hire me for illustrations. I have promoted my design work greatly throughout the internet so most of my clients have contacted me through my website http://arielgutierrez.com. Never give up! because every failure is simply a new learning experience that will make a person stronger and have success at the end. For somebody to be prescient one must have experience. Which tools is the most important for your work? I think that Search Engine Optimization (SEO) is by farthest one of the most important marketing and business tools of the 21st century. I use SEO and Google Analytics almost every day because it greatly helps analyzing my digital footprint. I think that it is essential for designers, photographers, graphic artists, and web developers to post their works in online websites such as Artstation, Behance and other social media which will add to their total keywords count online and help with SEO. In addition, it is crucial to view Google Analytics daily to gain data about visitors and possible clients. After finishing up my bachelor’s degree in mechanical engineering I would like to expand Ariel Designs and hire others to collaborate in the projects. Additive prototyping will continue to evolve and grow as technology progresses; for that reason, I would like to create a budget for 3D printing machines. Prototyping is a very powerful tool because it allows the designer to have their vision in their hands within minutes. What do you plan to achieve with your project? My goal is to inspire others to follow my sustainable design platform. I would like to encourage millennials who are entrepreneurs to seek their dreams and follow their passion. Ultimately, I would like to see my concept designs become reality and be manufactured.